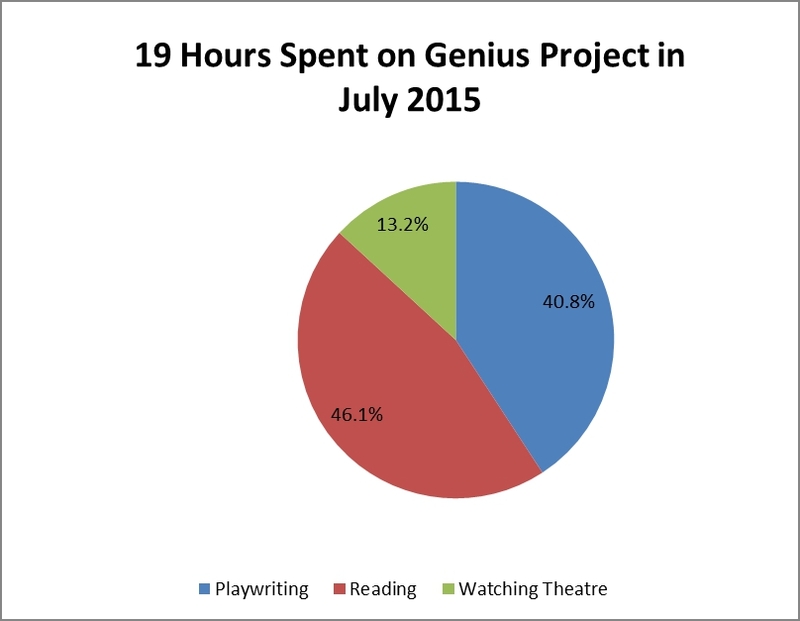 My July monthly total hours for the Genius Project was only 19 hours. That is less than my previous low in May. My long hours at work are taking a toll on my writing. I’m not blaming it all on work, of course. I should still be able to find a way to get things done; but I am finding that because I’m working 2 to 3 hours of overtime every day, I’m starting to wear down. I come home exhausted and wake up exhausted and go start it all over again. And because my schedule doesn’t give me two days off in a row, I feel like I never catch up on my sleep. I will figure it out, I hope. I know that the key is to go back to small increments and follow my checklist. When I start my day with a checklist and just go through the items on the list, it takes the thinking out of everything and makes it easier to do the things I’m supposed to do. It was Hamilton Fringe time in July and I only saw 2 shows because of my schedule. I enjoyed both shows very much: Sober But Never Clean by Richard Lett and Rukmini’s Gold by Radha Menon. I had planned on seeing more, but only got to the Fringe twice. I saw one show on a Thursday, but had intended on seeing four or five shows on the final Saturday of the Fringe. When I got there, though, I ran out of steam after the first show and went home to nap — which was not a commentary on the show I saw; I just didn’t have the energy to see any other shows because I was exhausted from work. My goal for August is to try to get my work hours under control, so that I’m getting enough rest, and get back to doing small amounts of Genius Project work. Sometimes it’s just the act of getting started that is all you need. Total hours done to date is 784.75 — only 9,215.25 hours to go.